Devised in the 1940s by the biologist C. H. Waddington, the epigenetic landscape is a metaphor for how gene regulation modulates cellular development. As a scientific model, it fell out of use in the late 1960s but returned at the beginning of the twenty-first century with the advent of big-data genomic research because of its utility among scientists across the life sciences to think more creatively about and to discuss genetics. In Epigenetic Landscapes Susan Merrill Squier follows the model’s cultural trail, from its first visualization by the artist John Piper to its use beyond science. Squier examines three cases in which the metaphor has been imaginatively deployed to illustrate complex systems that link scientific and cultural practices: graphic medicine, landscape architecture, and bioArt. 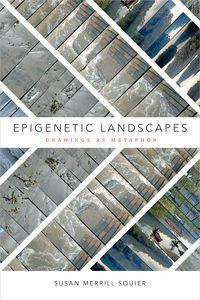 Challenging reductive understandings of epigenetics, Squier boldly reclaims the broader significance of the epigenetic landscape as a figure at the nexus of art, design, and science. Susan Merrill Squier is Brill Professor Emerita of Women’s, Gender, and Sexuality Studies and English at Pennsylvania State University. Her many books include Communities of the Air: Radio Century, Radio Culture and Liminal Lives: Imagining the Human at the Frontiers of Biomedicine, both also published by Duke University Press; Poultry Science, Chicken Culture: A Partial Alphabet; and, as coauthor, Graphic Medicine Manifesto.